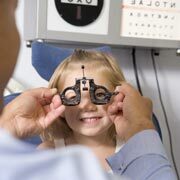 We are a full scope optometric practice dedicated to providing the highest quality vision care to children and adults in a friendly, comfortable, and professional atmosphere. With a highly trained staff and state of the art equipment, we go beyond 20/20. Treatment for Learning-related Vision Problems, including ADD/ADHD, Dyslexia, Reading, and Tracking Problems, etc.